Suitable for any cylinderal, oval, round and cone surface objects such as, shampoo bottles, milk bottles, cosmetic bottles, drums, cups, pens, cans and other containers, etc. A durable and trouble free Germany made "BOSCH" or Japan made "SMC" pneumatic components have bee used on the machine gives the most superior performance in process of printing. The working table can be easily adjusted, as wish, for precision registration purpose. Printing movement through synchronized transmission of gear and rack is used. A patented design of "positioning device" which is with several micrometric adjustment knobs located in the front, rear, left, right, up and down for precision alignment of registration and printing. 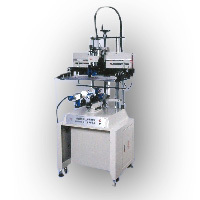 An Auto Registration Attachment is equipped with WE-400C1/500C1 applies to a precise registration for multi color printing.